THE STORY - Paris, 1884. An orphaned girl arrives in Paris from Brittany. Félicie Milliner is 11 and has no money but one big, passionate dream: to become a dancer. With nothing left to lose, Félicie takes a big risk: she 'borrows' a spoiled brats identity and enters the Opera Ballet School. But how long can she be someone else? Mentored by the tough and mysterious cleaner, Odette , Félicie learns that talent is not enough - it takes hard work to be better than her ruthless, conniving fellow students. That and friendship. Felicie's inventive, exhausting and charismatic best friend Victor also has a dream: becoming a famous inventor. Together, they both encourage each other to reach for the stars. THE GOOD - Decently animated with a nice message about persevering in the face of obstacles. THE BAD - A bland and predictable story with mediocre characters, less than appealing character designs, and a message seen in dozens of prior films hampered by shoddy corporate interference. Hey there, boys and girls. I have a question. Have you ever seen an animated movie about a couple of scrappy, down on their luck kids who want to live out their dreams if only they were given some help and a lucky break? If so, then you've seen everything “Leap!” has to offer. Well, unless you want to create a drinking game out of the number of times some variant of the word “dream” is used. 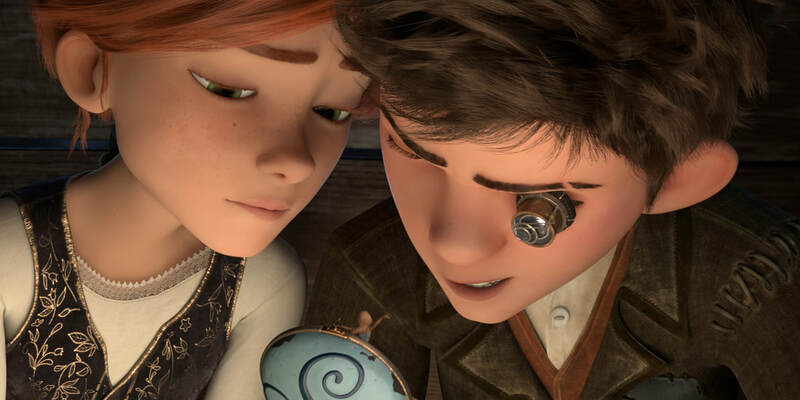 Félicie (voice of Elle Fanning) and Victor (voice of Nat Wolff) are two young orphans living in France in the 1880s. As far back as she can remember, Félicie has always wanted to be a ballet dancer, likely because of the ballerina music box she has as the last remaining token of her departed mother. Meanwhile, Victor wants to become an inventor because he's a tinkerer. One night, the pair escape from their depressing orphanage and flee to Paris. They'll seek to make their prospective dreams come true in the City of Lights. Right off the bat, I have some explaining to do. That plot synopsis makes it sound like the film is fairly evenly split in terms of focusing on the kids' efforts to achieve what they want. Such a notion is also what the film's marketing would have you believe. However, it's completely untrue. The overwhelming majority of “Leap!” focuses on Félicie's attempt to become a ballet dancer. This movie is about her, which makes the change in title from the original French language Canadian title “Ballerina” to the more uninteresting “Leap!” all the more conspicuous. Clearly, someone over at The Weinstein Company thought it was a good idea to diminish the focus on the film being a girl's story in favor of a more generic focus to appeal more to boys. Because movies focusing on females don't sell I guess. Unless we ignore “Frozen.” And “Tangled.” And “Moana.” And “The Hunger Games” franchise. Oh, and a totally unknown film from earlier in 2017 called “Wonder Woman.” On top of the less than honest marketing, there were also changes in the voice cast. Nat Wolff replaces Dane DeHaan in the American version. Mel Brooks and Kate McKinnon are also on hand in very minor roles. Looking beyond the corporate meddling in the marketing and voice cast, “Leap!” is exceptionally bland. Félicie wants to be a dancer, but she doesn't have an acceptance to the ballet school that is run by Merante, the most famous choreographer in France (voice of Terrence Scammell). She gets taken in by and begins training with a former top level dancer named Odette (voice of Carly Rae Jepsen) whose career ended after a leg injury (Also, I see what they did there with the “Swan Lake” reference in a ballet movie). Félicie works really hard, faces some struggles from her training and a rival dancer, tries to gain the respect of Merante, and is tempted by the charms of a talented male dancer. Oh, and Victor's along for the ride as he gets a low level job working for Gustave Eiffel during the Eiffel Tower's construction because this film is set in Paris and everyone knows the Eiffel Tower. The blandness of the story and characters might have been overcome a little if the art was anything special overall. The animation of the dancing scenes is actually pretty good. It shows off the grace and poise that ballerinas employ to do their work well. Unfortunately, the character designs and animation outside the dancing scenes leaves much to be desired. The animation is often too stiff and the character designs occasionally fall too close to the Uncanny Valley. Additionally, in case my earlier sarcasm didn't make it painfully clear, this film is about following one's dreams, despite the many obstacles one faces. While that is a generally nice message to have, it's delivered in such a clunky and heavy-handed way as to make more groan-inducing than inspirational, especially since it's a message we've heard before in so many other animated movies. The delivery isn't helped by voice work that, while not exactly bad, definitely doesn't stack up anywhere near the best that animated films can bring. In the end, “Leap!” wants to be an uplifting movie about a girl trying to become a ballet dancer. Sadly, the final product doesn't rise to those heights because of a flaccid story. The animation has some bright spots and the message is nice. But, the animation also has too many rough patches and the message comes with the subtlety of a jackhammer. Top it all off with corporate meddling that changes voice actors and tries to shift the focus away from the female protagonist and what you're left with is a dull flop. “Billy Elliott” this is not. And it is not recommended.